How do children react to pet loss and grief? The death of a cherished pet creates a sense of loss for adults and produces a predictable chain of emotions. The stages of grief are typically denial followed by sadness and depression, thenguilt, anger, and finally, relief or recovery. However, the effects on children vary widely depending upon the child's age and maturity level. An individual child's response to the death of the family dog depends on their ability to understand death and mortality. The death of a pet may be the child's first experience with death and loss. It can be a valuable opportunity to teach the child how to express grief in a healthy way. With all children, it is important to be as direct and honest as possible. Phrases such as "put to sleep" can be very frightening to younger children, who may develop a fear of going to sleep. Stories such as the dog "ran away" or "went to live on a farm" may leave the child feeling abandoned or else believing that the pet will return some day. Although it may cause the child some initial pain, it is far better to tell the truth, such as the pet "died" or "our veterinarian gave the pet a drug to stop its heart". Exactly what you should tell your child depends on the age of the child, their personality and emotional maturity, the relationship that the child had with the dog and the reason that the pet died. Child development experts advise us that children may have "magical thinking", believing that they are responsible for things that happen in their lives, including a pet's illness or death, or that if they wish hard enough their dog will get better. If the pet is being euthanised, you should talk openly with your child about whether they want to be involved in the process. You should also allow the child to talk openly about death, so that you can understand it from the child's point of view and provide reassurance as needed. Children may ask the same questions repeatedly. They also have fewer taboo subjects than many adults and may ask pointed questions that might seem morbid to adults. It is important that you act as a good role model; if you shield your child from the emotions that are part of your own reaction to grief, your child may feel that it is more 'grown-up' to hide their feelings. It is also important to tell other adults who play a significant role in the child's life (a favorite relative, teacher, neighbor, or school counselor) about the pet loss, so that they can offer support in this difficult time. What is the typical reaction to pet loss and grief in different ages of children? Children who are two or three years old typically have no understanding of death or permanent loss. They often consider death as a form of sleep. "Most psychologists agree that children should be told that their pet has died and will not return." Most psychologists agree that children should be told that their pet has died and will not return. The child may react by misbehaving, withdrawing or refusing to speak. The two or three year old should be reassured that the dog's failure to return is unrelated to anything the child may have said or done. They should be told that this is a natural and expected event and that they were an important part of the pet's life. Most children in this age range will accept a new pet with little fuss. Children in this age range grasp the basic concept of death but they believe that the pet is physically living somewhere else, such as in the ground or the sky. In the child's mind, the pet continues to eat, drink and play, or is 'sleeping' in this new place, and may still return home in the future. These beliefs may have been shaped by the child's previous experience with death or loss of a family member and the explanation of that event offered by adults or other children. 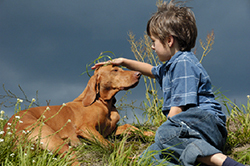 Children in this age group may believe that the dog died because the child was angry or had ill feelings towards the pet. Further, they may worry that if they become angry with another person or animal, they may cause the death of that person or animal. Some view death as contagious and begin to fear that their own death or that of others they care about is imminent. You need to talk about these feelings in a positive, non-patronizing manner. It is important not to be dismissive of these concerns; you should spend time exploring the child's feelings and reassuring them that death and grief are a normal part of life. When discussing the child's feelings, it is better to have several short informal talks rather than a long discussion. "The permanence of death becomes real to seven to nine-year old children." The permanence of death becomes real to seven to nine-year old children. Although children in this age group often believe that they will not die, some may develop concerns about the impending death of their parents. They also may become very curious about death and its implications. Parents should be ready to respond frankly and honestly to questions that may arise regarding mortality, either for the child or for others, including animals. Several manifestations of grief occur in these children and may include withdrawal, over-attentiveness, and "clingy" behavior. The child may develop problem behavior at school or home, showing learning difficulties, aggression, or imaginary health problems. Some children may initially act as if the loss of the pet is inconsequential, but react with feelings of deep grief several weeks or months later. It is important that parents not dismiss the delayed feelings; the child should NEVER be told that they "should be over that by now" or that "it happened so long ago, I've almost forgotten it". 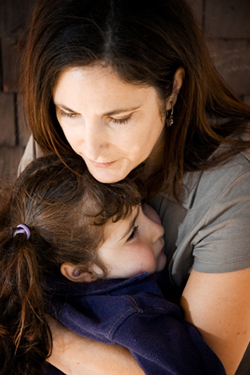 Rather, the child needs support and reassurance that what they are feeling is normal and natural. Children in this age range generally understand death as natural, inevitable, and universal. Consequently, these children often react to death in a manner very similar to adults. Even though they appear to be reacting in an adult manner, they should be treated in a similar fashion to seven to nine year old children. "Many adolescents exhibit various forms of denial, especially during the initial stages of grief." Although this age group also reacts similarly to adults, many adolescents exhibit various forms of denial, especially during the initial stages of grief. This usually takes the form of a lack of emotional display, meaning that teenagers may experience deep grief without any outward manifestations. It is important to encourage adolescents to discuss their feelings about death and not become emotionally apathetic about such a serious and important topic. An open and honest discussion with caring adults will have tremendous impact on how adolescents develop coping mechanisms as adults. The loss of a pet can be particularly difficult at this age, especially if the pet has been a family member for many years. "Young adults need the same opportunities to voice their feelings as any of the other age groups." Some psychologists say that loss of such a pet represents a "rite of passage" to adulthood. Young adults need the same opportunities to voice their feelings as any of the other age groups. Young children usually cannot express their grief in words, mainly due to a lack of verbal skills. However, they can be encouraged to deal with their grief through drawings, play, or other activities such as planning a memorial for the pet. There are a number of well-written children's books that deal with the subject of pet loss, that are readily available for purchase or at a lending library. Pet loss can disrupt the normal balance in a family and it can be helpful to solicit outside assistance. 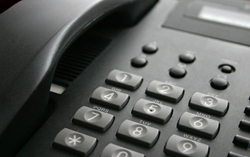 "Professional bereavement counselors are available in most cities." Professional bereavement counselors are available in most cities. If you are having difficulty with grief over the loss of the family dog, please contact our veterinary hospital. We can provide assistance and contact numbers of professionals and pet loss support groups in our area who can help you and your family.